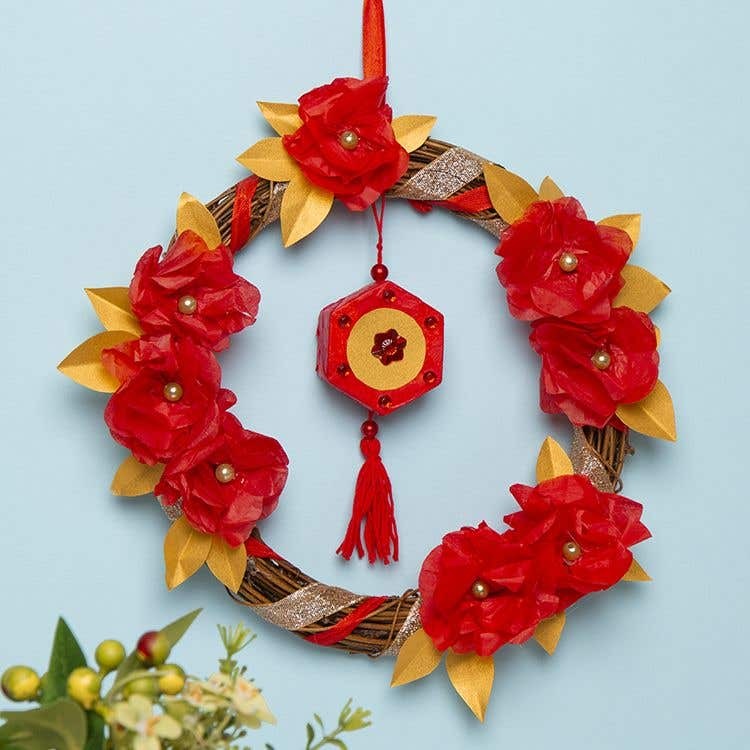 Create your own red and gold Chinese New Year wreath with a decorative 3D lantern and paper flowers. 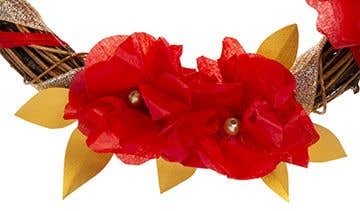 Wrap a piece of ribbon all the way around wreath then tie the ends together in a knot to hold it in place. If the ribbon isn’t long enough to go all the way around the wreath, tie 2 pieces together. Wrap more ribbon around the wreath to add another colour. Tie a loop of ribbon at the top of the wreath. To make the flowers, cut some 12cm circle from tissue paper. You’ll need 3 x circles to make each flower. It’s quicker to stack several sheets of tissue together to cut the circles, rather than cutting each one separately. Fold each circle into quarters then cut a wavy or scalloped edge. Open out each piece of tissue paper, crinkle it up then stick 3 pieces together with a small amount of glue applied in the middle so the layers stay together. Glue a pearl bead in the middle of the flower. Repeat to make more flowers in the same way. To make the leaves, fold a strip of gold paper in half to make a crease. Cut out some simple half leaf shapes, 4cm – 6cm in length with the fold in the middle. Make 15- 20 leaves for the wreath. To make the lantern, remove the lid from a mini craft box. Brush glue over the box and lid then cover with small pieces of tissue paper until both sections are covered. Leave to dry. To make a tassel for the lantern, start by holding 3 fingers together. Wrap embroidery thread around your fingers 10-15 times to make a series of loops. Carefully slide the loops off your fingers and tie a 30cm piece of thread on one side to hold the strands together, leaving the long ends for attaching the tassel the lantern. Cut across the loops at the bottom and tie another piece near the top to make a bobble shape. Trim the ends of the tassel into a neat shape. To attach the tassel onto the lantern, make a hole using a sharp tool or pointed scissors in the side of the bottom section of the box, in the middle, and another hole on the facing side. Thread a bead onto the top of the tassel then push the ends of the thread through one hole in the box, through the middle then out through the facing hole. Thread another bead at the top and tie a double knot to hold it in place. Fit the lid back onto the box with some glue and a strip of red tissue paper to seal the join. 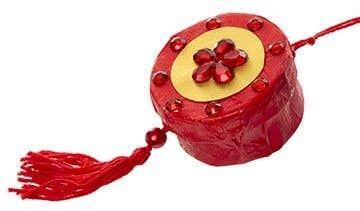 Decorate the front of the lantern with gems and cut out gold paper shapes. Tie the ends of the thread in a loop around the top of the wreath so it hangs in the middle. 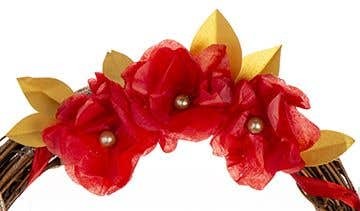 Use a glue gun to attach the flowers and leaves around the wreath. The lantern could be made as a stand-alone decoration, without the wreath, using mini craft boxes in different shapes.